Essential oils are time-tested treasures gaining new popularity among fans everywhere. These potent liquids are fun and fresh ingredients that you can customize for almost any oral hygiene need. As with any DIY dental treatment, do your research and be cautious. Not all oils are safe to ingest and some may hurt you if applied directly onto your skin. Essential oils are distilled from plants and usually sold singularly—one ingredient per bottle although you can also find oil blend products. Like other supplements, the Food and Drug Administration does not regulate their safety or efficacy. Cinnamon, peppermint, spearmint, and tea tree essential oils are all believed to be antimicrobial, which means they kill germs that cause pain, disease, and decay. Myrrh oil is antimicrobial and may also soothe and heal gums by increasing blood flow to the tissue. Clove oil is antimicrobial and may also aid in numbing pain. Promote healthy gums and fresh breath with an essential oil mouth rinse. Use five to ten drops of your choice of oils per one cup of water. Swish one tablespoon of the mix at a time and spit out like you would any other mouthwash. Prevent tooth decay and fight plaque by putting two drops of an oil of your choice on your toothbrush. Brush gently and spit out excess oils and saliva. Bonus tip: Keep your toothbrush clean (and therefore the rest of your mouth) by regularly placing it in a 1/4 cup of peroxide mixed with one drop of an essential oil. Let it sit for at least ten minutes before shaking it off and leaving it out to dry. 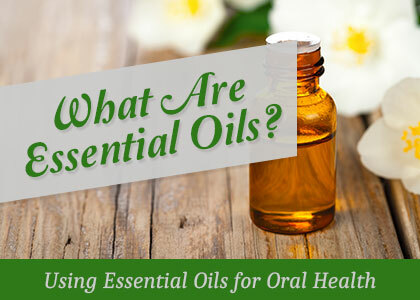 Used in conjunction with regular brushing and flossing, essential oils can be a powerful part of your preventative oral hygiene routine. As always, make sure you run everything by your dentist—especially DIY ventures and less-conventional practices. If you’d like to get a more in-depth, professional opinion on the matter, call your Shelby dentist, Dr. Marissa Miller at Discovery Dental and make an appointment today!